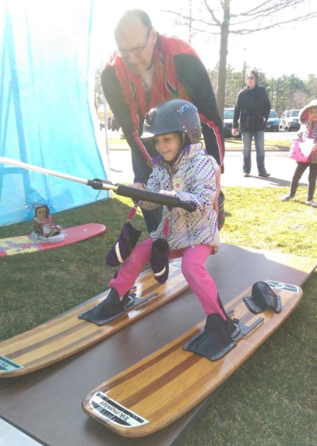 Maybe joining the Ski Sprites is a little too much, but you or your kids want to learn how to ski? Perfect! Every year, we host a learn to ski camp at Lake Altoona for one week to teach the skills needed to water ski in a safe manner. After this camp, you will be able to impress anyone on your lake! Whether a first-time or experienced waterskier, the Ski Sprites Learn to Ski Week is the best way to improve your skills. We have the right equipment, trained boat drivers, and talented instructors. Each 3 hour session costs just $25 per student. You'll have fun and learn fast. The 2018 Learn to Ski Camp will be held the week of June 18-22! Our on-line signup form for 2018 is now available Here! Q: What ages are appropriate? A: You'll want a swimsuit and towel. Sunscreen is usually a good idea. On cool days you'll want warm clothes for afterwards. A: Lake Altoona County Park Beach, the same place as our Ski Sprites' shows. Note the park does require an Eau Claire County Parks Vehicle Pass which is $3 daily or $25 annual and is good for all Eau Claire County parks. A: The morning sessions start at 9am and the afternoon sessions start at 12:30pm. Plan to arrive 15-20 minutes ahead of time. ​Q: What if it is raining? A: In case of light rain or scattered showers, we will typically continue to ski as long as there is no thunder or lightning. If a session needs to be cancelled due to thunderstorm or other sever weather, those signed up for the session will be contacted via text message or phone number that you entered in the on-line signup form. We'll also post a message on the skisprites.com homepage and Facebook page. Q: Are there still spots available? Is there a waiting list?